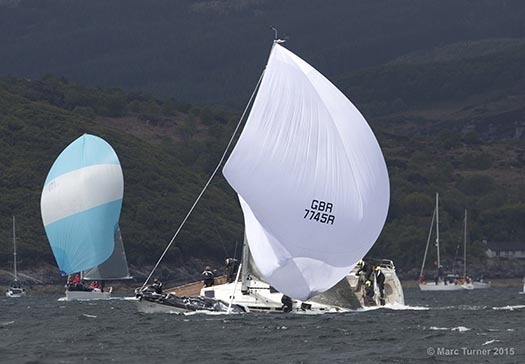 #scottishseries – Waterford and Dublin Bay yachts top the leaderboard of class two at Scotland's premier sailing regatta, the Silvers Marine sponsored– Scottish Series at Tarbert, as the annual event enters its final round this afternoon. Rob McConnell's A35 Fools Gold from Waterford Harbour Sailing Club leads IRC Two by a single point from the National Yacht Club's J109 Something Else, skippered by John and Brian Hall. In fourth place overall in the 14–boat fleet is former ICRA National Champion, the J109 Storm, skippered by Pat Kelly of Howth Yacht Club. Full class two results are downloadable below. Other Irish interest from the Clyde includes Stephen Quinn's Lambay Rules lying third overall in IRC 4 where nine boats are competing. Here's the latest available PR from the Scottish series after Day Two (Saturday): After a great second day of sailing there's still everything to play for in Silvers Marine Scottish Series. Super Saturday lived up to its name, conditions were challenging with a light southerly blowing 10 – 12 knots, but the sun shone and it was a spectacular day showing Argyll at its best. There were plenty of thrills and spills and in IRC Class 2 Alistair Shires of Sloop John T became the first casualty of the event, after an onboard incident. Alistair swapped the waters of Loch Fyne for hospital but we're delighted to say he's fine and will be back onboard in the near future. In IRC Class 1 Silvers Marine Scottish Series main sponsor Jamie McGarry is now leading the table having had a great day on Loch Fyne. Rod Stuart and William Ram's Aurora is just two points adrift of the top spot with Steven Cowie's Zephyr falling to third. With two races tomorrow we're looking forward to some more fierce competition on the water. IRC 2 sees a change at the top with Sloop John T taking the top spot. The conditions suited the boat perfectly and this coupled with good tactics and handling saw them rewarded. Something Else remains in second and Kevin Aitken in Animal keep a hold of their third spot. 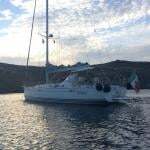 Moving onto the IRC Class 4 and the start of the Crewsaver course and it was Roddy Angus' Trastada who had the best day and really found their pace. 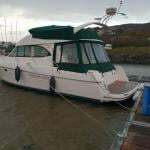 They're seeing their hard work paying off following a major boat optimisation. Craig Latimer's Wildebeest V falls to second following an OCS and McVey / Darge and Black's Phoenix rises to third. The racing in this class is very tight and tomorrow's racing will be very interesting. In CYCA Class 5 Geoff and Norman Howison's Local Hero appears to be in a class of their own. They stay well ahead of Howard Morrison in Enigma and Ian Macdonald's Significant who had an excellent day. It's still Alan Dunnet's Valhalla of Ashton at the top of CYCA Class 6 leading Stargazer in second, while Andy Malcolm's Nemo was finding pace in third. CYCA Class 8 Restricted Sail. The Jochr in the pack pulled a lead of two points ahead of Windhound and North Star in third. There are no discards in this class yet and Windhound could still hang in there but will have to discard a retrial. CYCA Class 9 Restricted Sail sees Stephen Owen in Halcyon hanging on to first while John Roberts' Poppy leapfrogs Clive Reeves' Lyrebird to take third. Sigma 33 Class and its still Harper and Robinson's Leaky Roof 2 at the top of this tightly grouped section. Gallagher and Bradshaw's Busy Beaver worked hard to take second place from James Miller's Mayrise. In National One Design Sonata Series Steve Goacher's Eric the Boat took three firsts today to see him dominate this class. Cochrane and Galbraith's Old School, lying in second, secured three seconds while D Matthew's White Magic holds onto third. Ovington Boats maintain their lead in the VX Class ahead of Jono and Benji Shelly's Robber's Dog, who was let off the lead, in second and Duncan Hepplewhite's Zhik who was barking up the wrong tree today in third. The J70 Scottish Championships table stays the same with Ian Aitken in boats.com in first, Paul Heys and S Hawthorn's Jacuzzi in second and Christopher Hawforth's Django in third. These boats enjoyed a great day's sailing and Loch Fyne certainly suited them. It's tight at the top of the Hunter 707 Class with just three points separating the first three boats. M Fleming and D Smith's Rammie leads with Carl Allen's More T Vicar with T Clark and S Parker's Black Sheep in third.